LLOYD REES: coming home is very much a personal look at the artist and his work through the eyes of his son and daughter-in-law, Alan and Jan Rees. The works chosen relate to the home and favourite places in which the artist lived or often visited: Brisbane, Sydney Harbour and Werri Beach in New South Wales, the Derwent River in Tasmania and citiesand regions in Europe. The exhibition has been developed by Lawrence Bendle and Lisa Loader and ranges from Rees’s earliest cathedral drawings in 1915 to his last paintings in 1988. It reveals the artist’s mastery of painting in oils and watercolour, pencil, pen and ink and charcoal drawing and printmaking. 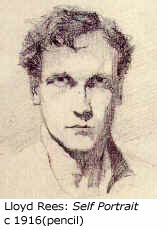 Lloyd Rees (1895-1988) occupied a unique position in Australian art: he was critically accepted by traditionalists and modernists alike, and respected for both the great serenity of his light-filled paintings and his sensitive handling of a wide range of drawing and print media. Many younger artists found Rees inspirational, as Brett Whiteley recalled: " I first saw an exhibition of Lloyd Rees’s painting when I was a fourteen-year-old kid in school cadet uniform. 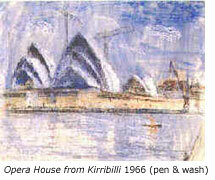 I used to carry my easel around Sydney Harbour and stand where Lloyd stood, to copy his paintings. My generation of artists has to get in a lot closer to the subject -- Lloyd has that more pulled-back European view. But his attitudes, instincts and tremendous capacity as an artist were always incredibly exciting to me." During his long career, Rees moved from early architectural drawing in Australia and Europe to late atmospheric landscapes reminiscent of J.M.W. Turner. Rees above all sought to express an ideal of harmony between man and nature. 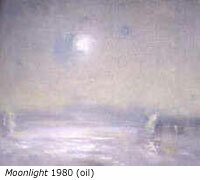 He found inspiration in quiet pastoral surroundings: he loved to paint figures strolling along riverbanks, and boats scudding across breezy harbours; houses glimpsed over rolling hills or through fringes of bushland; worshippers in old cathedrals; winter morning ferry rides and summer drives along back roads. 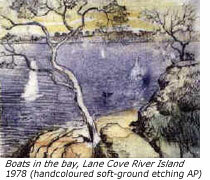 In the insightful and very readable book that accompanies the exhibition, Alan and Jan Rees share some personal memories of the artist, revealing some of the struggles and challenges of Lloyd Rees's early life, his experiences in London, Paris, Italy, Sydney and Gerringong, New South Wales (where many of his landscape paintings were done), his warmth and generosity. The book is fully illustrated and includes detailed accounts of individual works in the exhibition and of Rees's life and career. It was written by Sue Smith, who spoke to Alan and Jan Rees. The Rockhampton Art Gallery's art collection, exhibitions and public programs have done much to provide central Queensland with a high cultural profile. The gallery specialises in Australian painting by such notable artists as Arthur Boyd, Russell Drysdale and Sidney Nolan, and each year welcomes many Australian and international visitors.